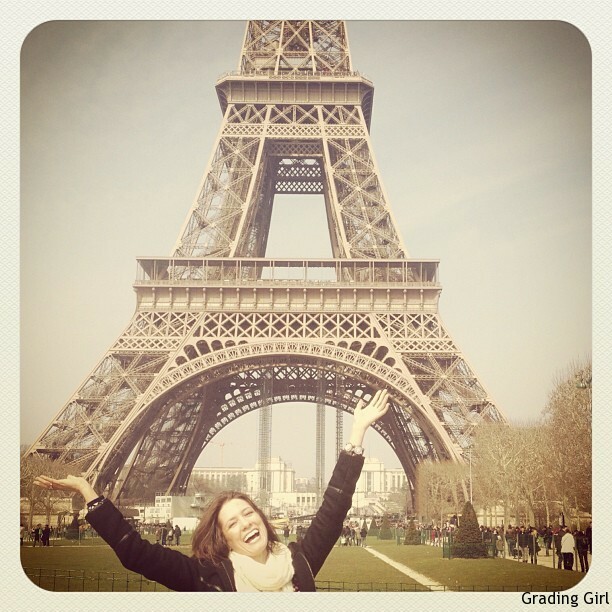 While spending spring break in London visiting my daughter studying abroad, we planned a day trip to Paris. 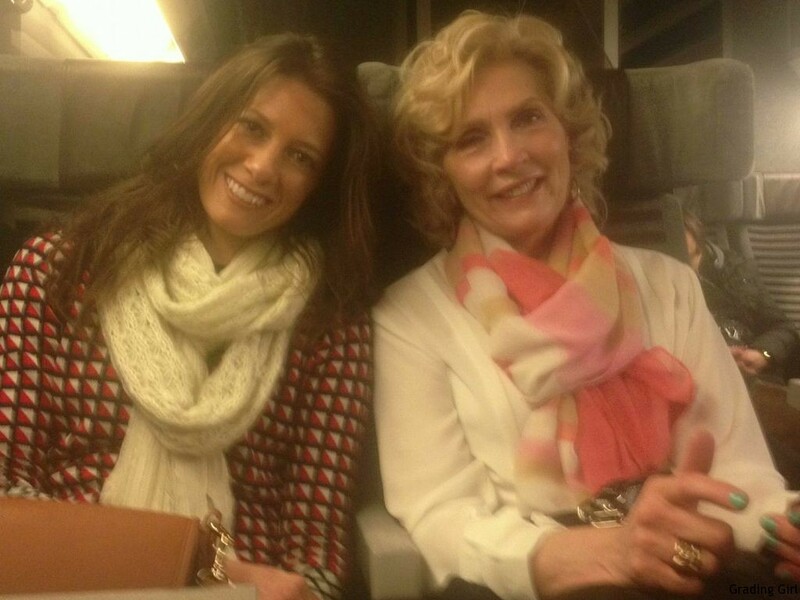 Taking the earliest Eurostar train (bright and early @5:30am! ), we arrived in Paris by 7:30am and stayed until the last train departed at 9:15 pm. What a pleasant excursion – clean, comfortable and delicious breakfast choices. Thanks to my daughter’s advance planning and subway navigation, we were able to visit no less than five landmarks and still have time to shop boutiques and indulge at a couple authentic cafes. Needless to say, all four of us were exhausted upon return but I definitely wish to return and meander longer to truly experience the essence of this romantic city. 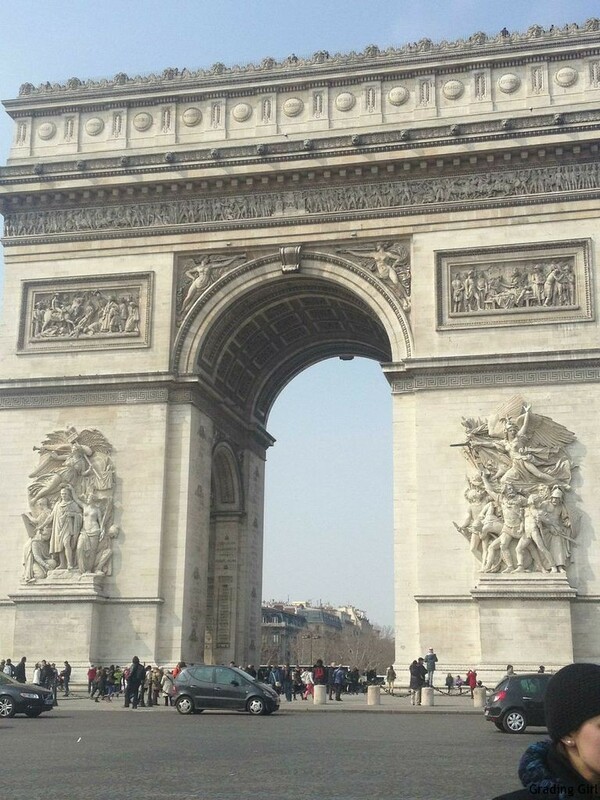 A sample picturial of what we saw during our day in Paris . . . I found Parisians to be extremely polite. They seemed to appreciate my attempts to speak back to them en francais or, perhaps in my case, “franglais.” It was fun in cafes and shops to converse back and forth. Je parle un peu de francais, et vous?! 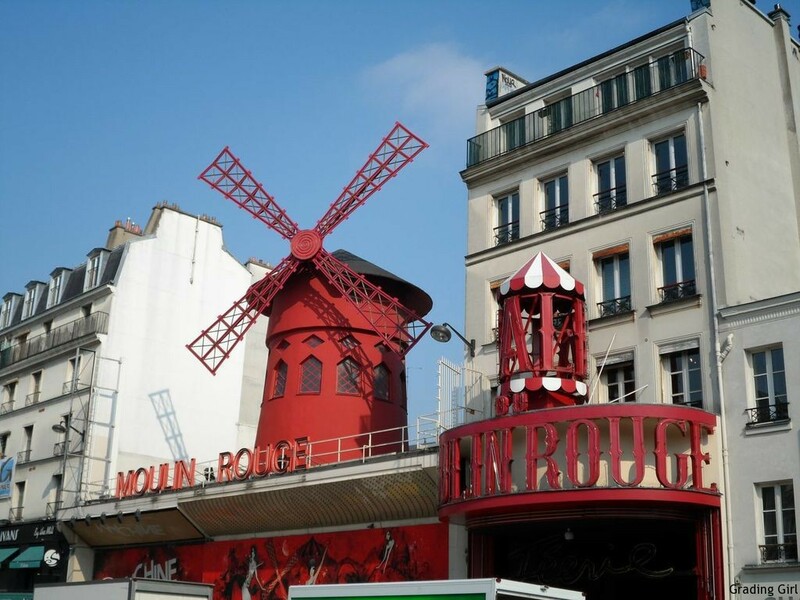 Since my daughter already stayed in Paris on a previous visit, she lead us to a destination she had yet to see – Moulin Rouge. Despite the lime green truck parked in front, this infamous theatre looks just like the pictures. We peeked in the windows but during the early morn hour, there wasn’t any can-can dancing going on. 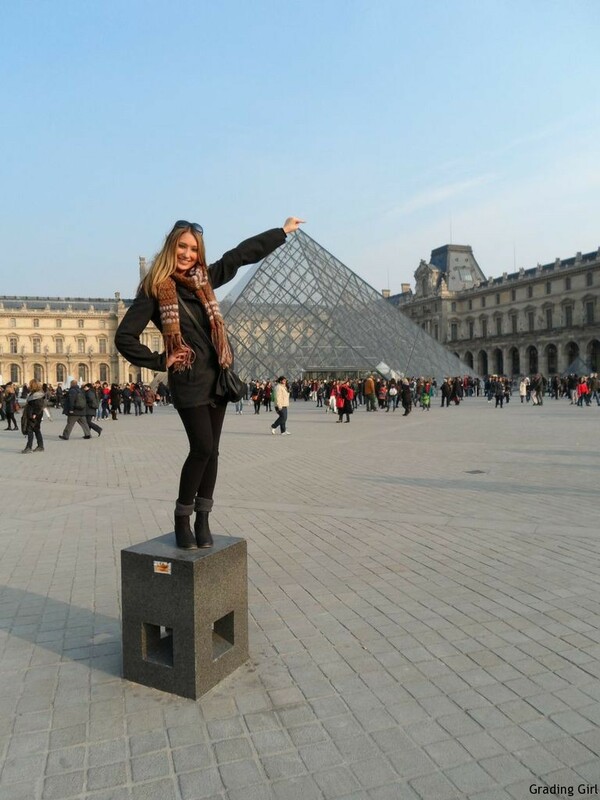 Next stop, the Eiffel Tower. I expected to spot this famous landmark as soon as we stepped out of the subway stop. No such luck as the lattice design was nowhere in sight. But . . . . 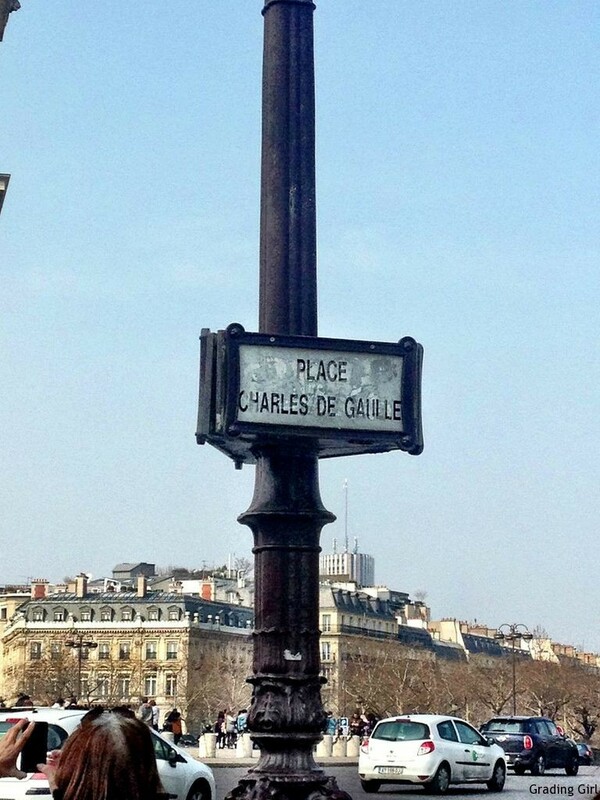 I will never forget turning that corner from the first building on that street near Champs de Mar – GASP! My breath was literally taken away. There she was in all her glory – the beautiful tower I’ve seen in so many pictures and drawings all my life. The sun was shining down on her, a dream come true to see with my own eyes. Words cannot truly describe my awe. If not for the brisk weather and more to see, I could have easily stayed in that vicinity all day. Having the crepe vendors nearby (banana nutella, anyone?!) made it all the sweeter. 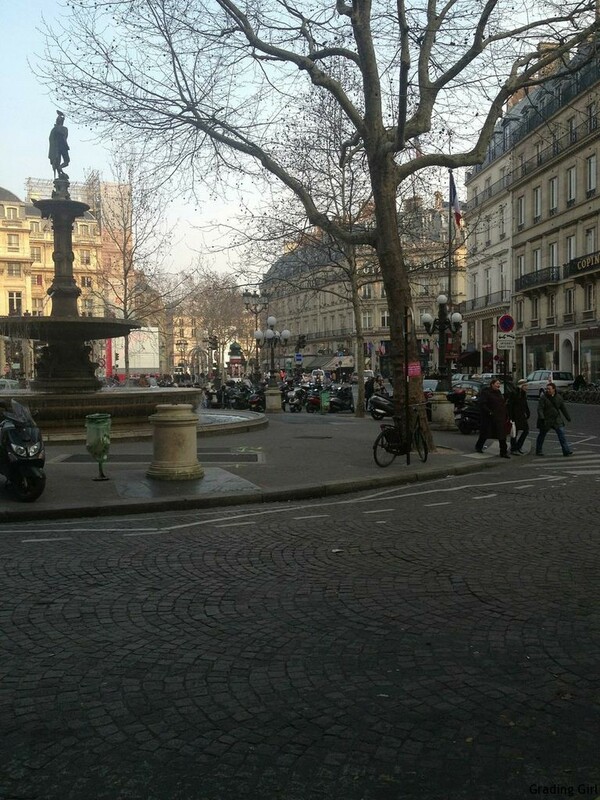 After taking many, many pictures, we finally transitioned to our next stop – the Avenue des Champs-Élysées. So many shops to stop into here . . . such incredible architecture to snap pictures of. One dismay, I was surprised of the many American stores here on this famous street. Amusing case in point: We walked toward one large store front that was roped off with two men standing on either sides of the entrance. I look up and see that it’s Abercrombie & Fitch! ????? Arianna explained that apparently the chain is still VERY popular overseas. Interesting. . . not what I came to Paris to shop for but to each his own. Here’s a shot of a random street I strolled down. I’d love to sit and read here in warmer weather . . .
Our last stop was the Louvre Musèe. We wandered through the museum and adjacent shopping area for quite some time. Mona Lisa and the Greek & Roman masterpieces were my favorite; however, the architecture of the museum itself is beautiful. I was tickled when my daughter recognized a few of the paintings from a memory card game we played years ago – those educational toys pay off. Departure creeped upon us all too soon. I will be back. Until next time, au revoir.